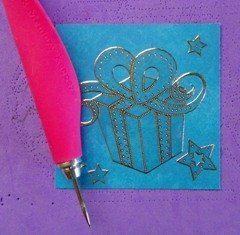 Learn how to make your own birthday card and make someone's special day even more memorable with a specially homemade gift! 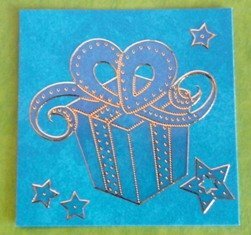 On this page, DT Member Christy will show you a unique fun birthday card you can try at home! Hi! 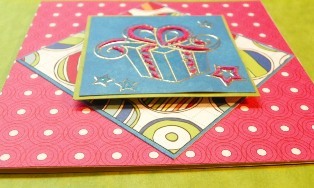 I'm Christy and I'll be showing you how to make your own birthday card today. I hope you enjoy this tutorial and try this yourself! 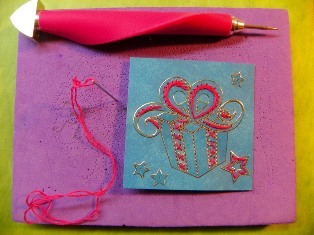 Take present stitched dazzle and place on blue cardstock that measures 2 ½” squared. Take either needle or paper piercer and pierce through the blue cardstock where there are holes on the dazzle. Thread needle with two strands of the hot pink floss. Follow directions on the stitched dazzles package as to how to sew the floss. When finished sewing adhere the blue cardstock to the green cardstock. 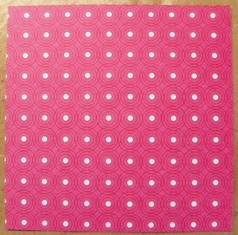 Adhere the pink polka dotted patterned paper onto the card base. 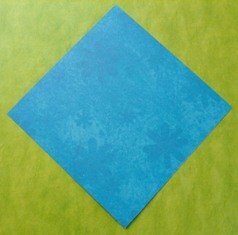 Take the other patterned paper and adhere to larger blue cardstock. 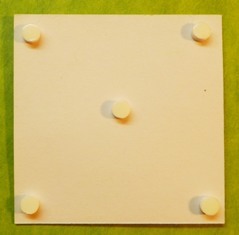 Adhere these in a diamond shape onto the polka dotted paper. 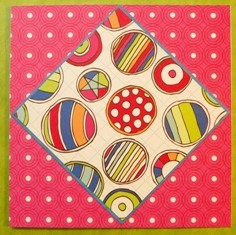 Use Foam dots to adhere the dazzled cardstock pieces to the diamond shaped paper. 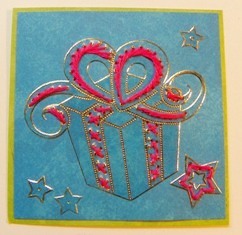 Take greeting “Best Wishes” from Greetings Dazzles and place on bottom left of card for your finishing touch! And that's basically how you make your own birthday card. Easy right? :) Here's our card again..
Hope you enjoyed this tutorial! 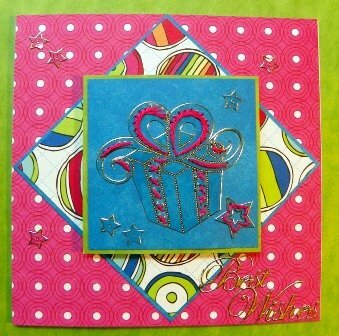 The Design Team has also come up with gorgeous card ideas in different themes so I hope you check those out too! See this page for more inspiration!